Note the area of the lower receiver just in front of the buttstock attachments. The lower gun has an area of heavy thickening. This is one of the places where these guns will fail after long term use. The lower pictured model was redesigned to last longer. Many early M16A2 versions were built on the weaker, earlier lower receiver. Get one on the reinforced receiver if possible. These are often among the “Product Enhanced” versions. The M16’s receivers are made of aluminium alloy, its barrel, bolt, and bolt carrier of steel, and its handguards, pistol grip, and buttstock of plastics. Early models were especially lightweight at 6.5 lb without magazine and sling. This was significantly less than older 7.62 mm “battle rifles” of the 1950s and 1960s. It also compares with the 6.5 lb AKM without magazine. M16A2 and later variants weigh more (8.5 lb loaded) because of the adoption of a thicker barrel profile. The thicker barrel is more resistant to damage when handled roughly and is also slower to overheat during sustained fire. Unlike a traditional “bull” barrel that is thick its entire length, the M16A2’s barrel is only thick forward of the handguards. The barrel profile under the handguards remained the same as the M16A1 for compatibility with the M203 grenade launcher. The rifle is the same length as the M16A2. The A2 has a round foreward assist. Most, but not all A2’s have a brass deflector and an enhanced site mechanism. Several A2 models use the A1 sight for simplicity. Above shows the A1 barrel profile of the Model 711 M16A2 compared to the lower, Model 715, with the A2 M16A2 barrel profile. Both have the later enhanced, reinforced, A2 receiver. The last Colt black rifle M16 that was released for sale, prior to the 1986 ban, was the Colt M16A2 Model 701. 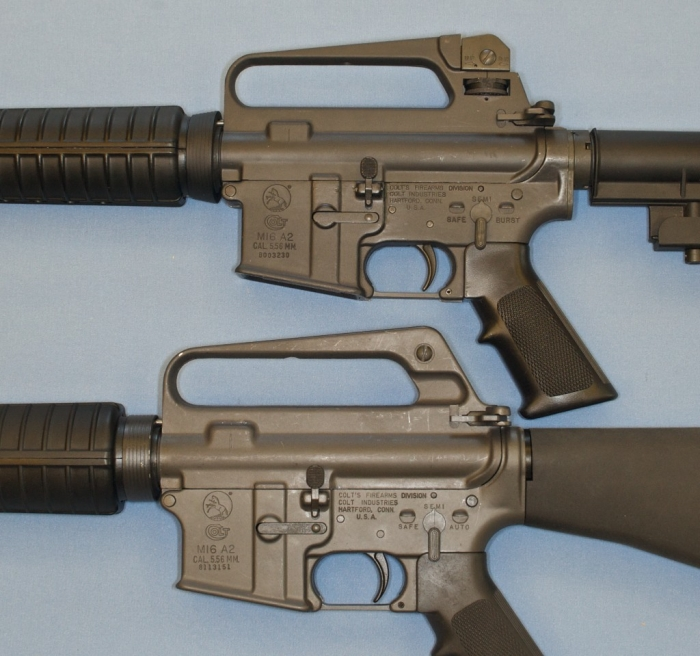 These M16 rifles have the complete M16A2 profile, with full A2 uppers and a reinforced lower receiver. The Colt M16 Model 701, in new condtion, are some of the rarest machine guns available for transfer. The HBAR versions have thick barrel profiles throughout. One distinctive ergonomic feature is a plastic or metal stock directly behind the action, which contains a recoil spring. This serves the dual function of operating spring and recoil buffer. The stock being in line with the bore reduces muzzle rise, especially during automatic fire. Because recoil does not significantly shift the point of aim, faster follow-up shots are possible and user fatigue is reduced. Another distinctive ergonomic feature is a carrying handle on top of the receiver, with an integrated rear sight assembly and charging handle. This design is a by-product of the original design where the carry handle served to protect the charging handle and mount a scope. In practice, the handle is rarely used to carry the weapon and doing so is expressly prohibited in many military organizations, as it is considered unsafe. Holding the weapon by the pistol grip provides quicker response time and better “muzzle awareness,” while a shoulder sling provides a more convenient option when response time is not a concern. More importantly, with the sight plane 2.5 in over the bore, the M16 has an inherent parallax problem that can be confounding to shooters. At closer ranges, the shooter must aim high in order to place shots where desired. Newer models have a “flattop” upper receiver with a Picatinny rail, to which the user can attach either a conventional sighting system or numerous optical devices such as night vision scopes. The M16 utilizes direct impingement gas operation; energy from high-pressure gas tapped from a non-adjustable port built into the front sight assembly actuates the moving parts in the weapon. Combustion gases travel via a gas tube above the barrel directly into a chamber in the bolt carrier behind the bolt itself, pushing the carrier away from the bolt. This reduces the number of moving parts by eliminating the need for a separate piston and cylinder and it provides better performance in rapid fire by keeping reciprocating masses on the same axis as the bore. If you would like to contact Colt directly, please click here.